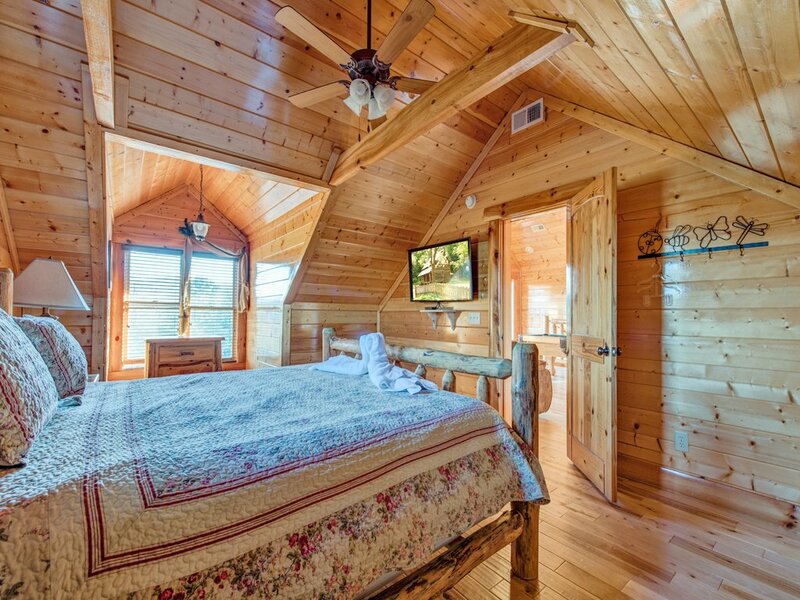 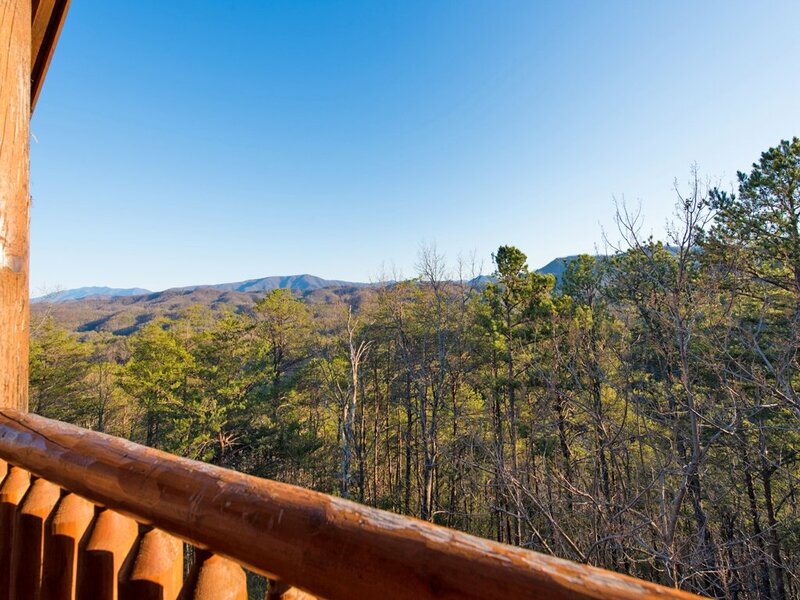 Located on a half-acre in Wears Valley, sometimes called “the quiet side of the Smoky Mountains,” Majestic Highbearnation is a bastion of serenity with spectacular views to boot. 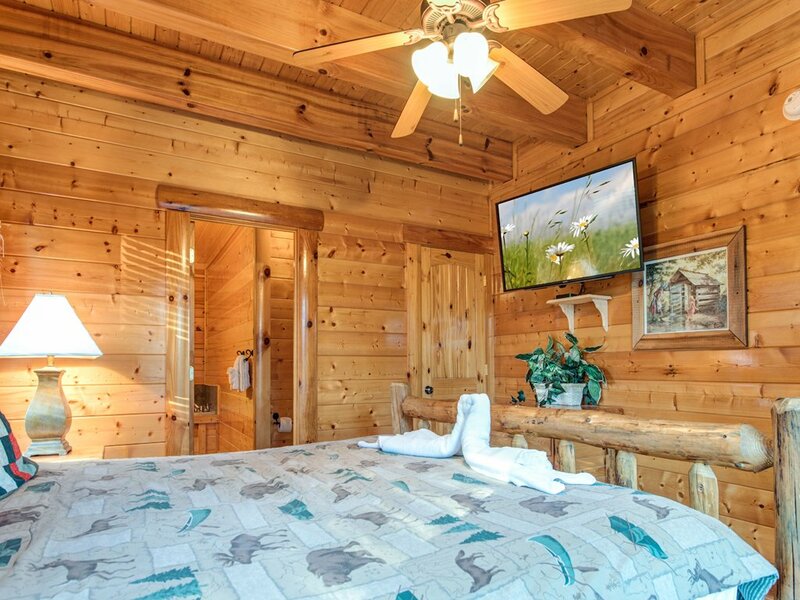 But it’s also just a short drive to the restaurants, shops, and attractions of Pigeon Forge. 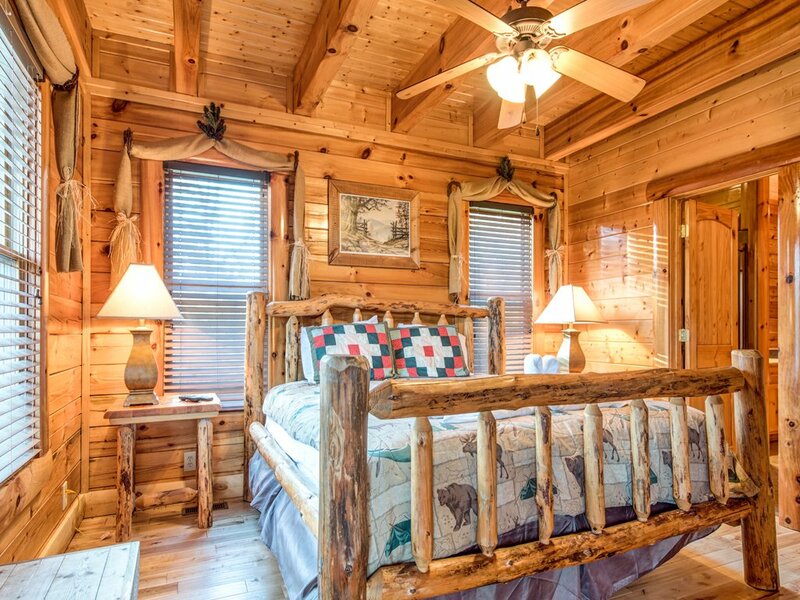 When you stay here, you really can have it all—and because the cabin is pet-friendly, you can share it all with your four-footed pals. 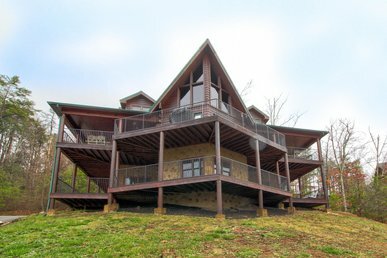 Majestic Highbearnation can sleep a dozen people on its 2 floors. 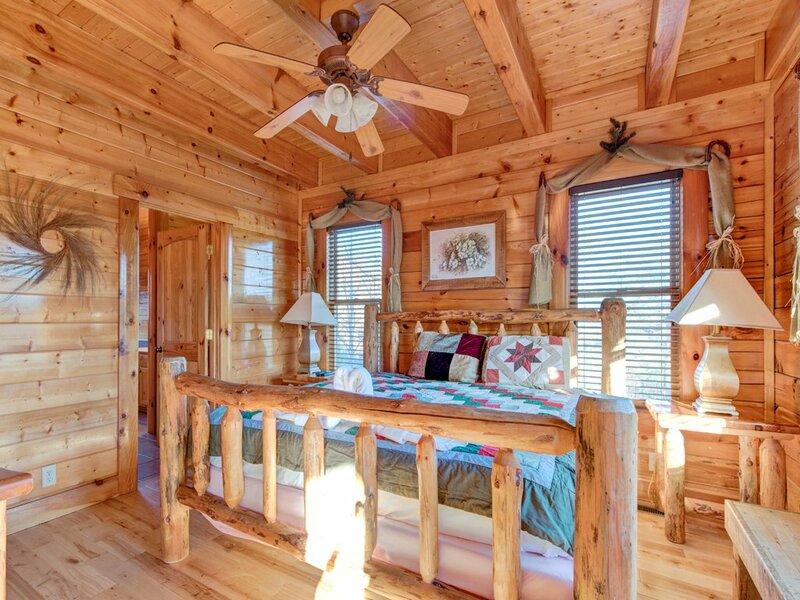 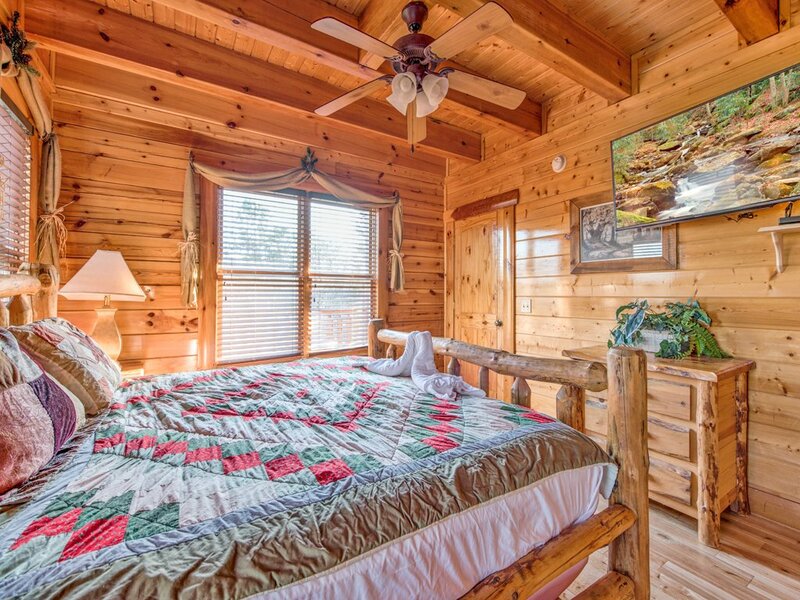 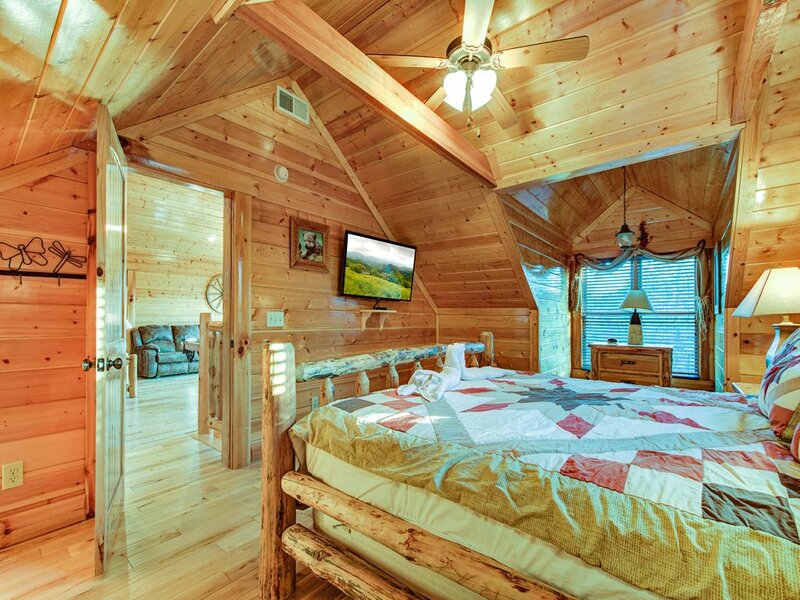 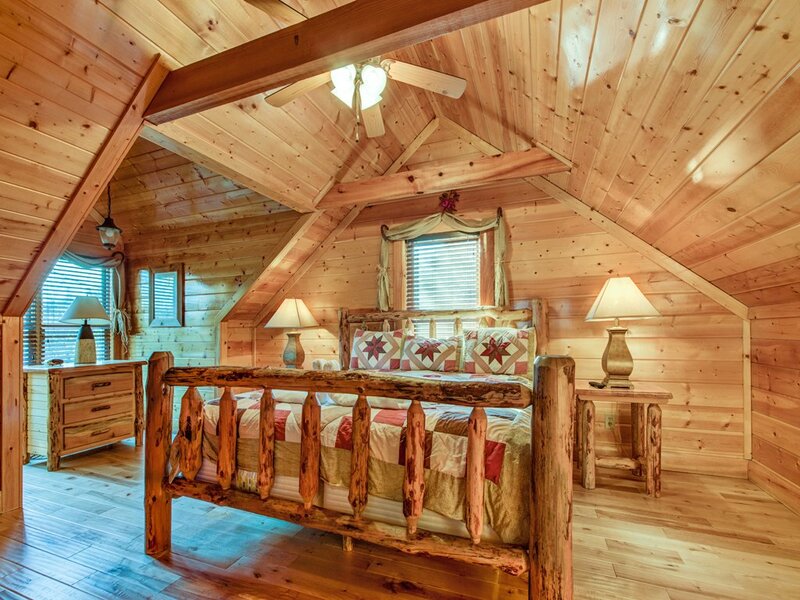 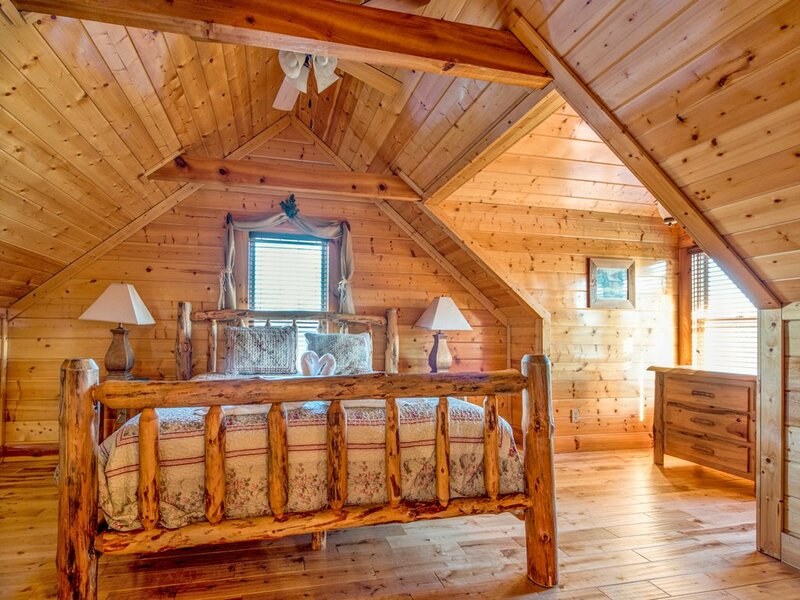 Each of its 4 spacious bedrooms has a king-size bed and a flat-screen TV, making the cabin as well suited for several couples vacationing together as it is for a family (or 2!). 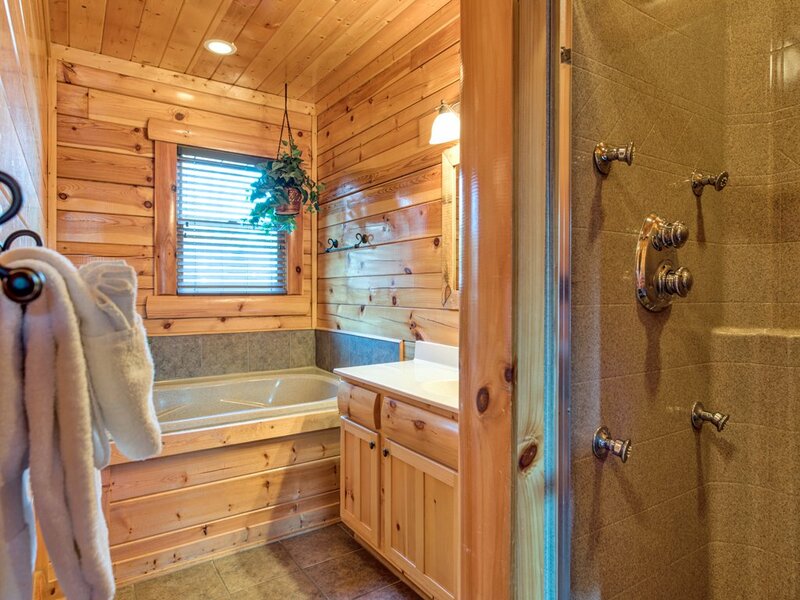 The 2 bedrooms on the main floor are true suites: Each has its own private bathroom with a shower and a jetted tub—how’s that for luxurious? 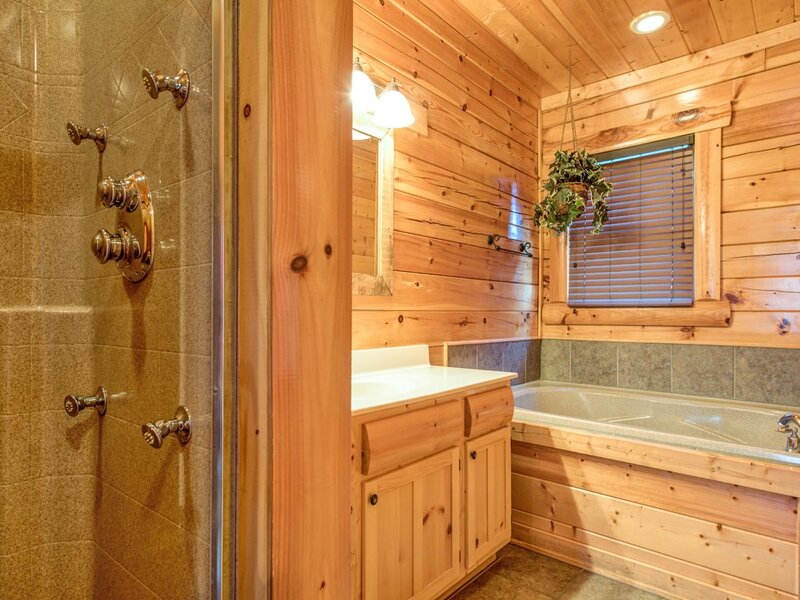 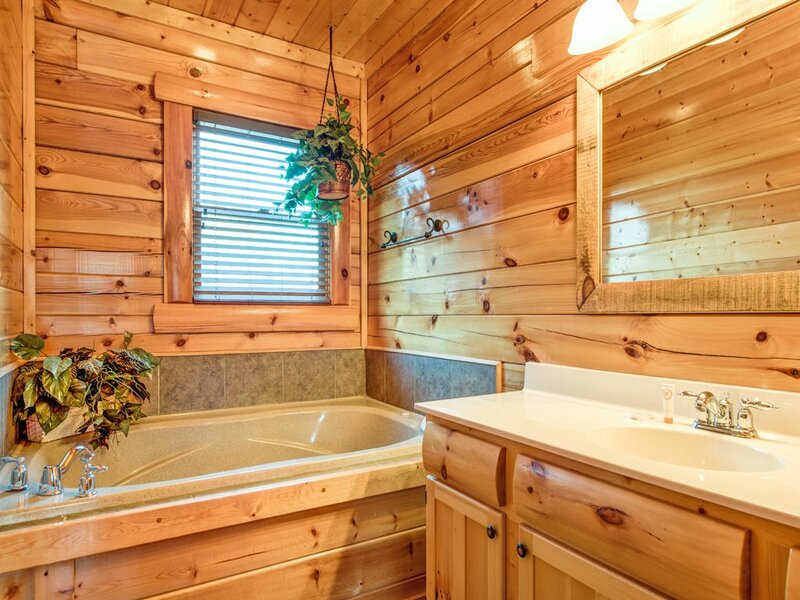 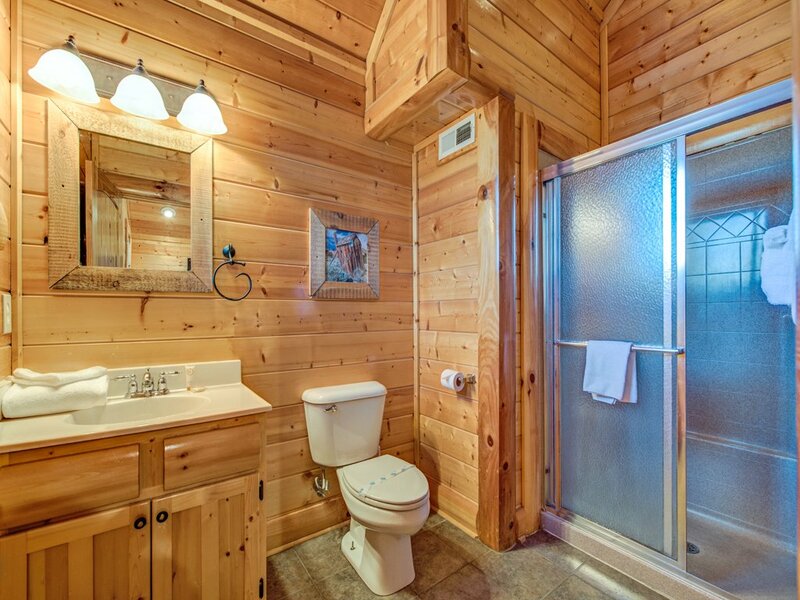 The 2 upstairs bedrooms share the 3rd bathroom. 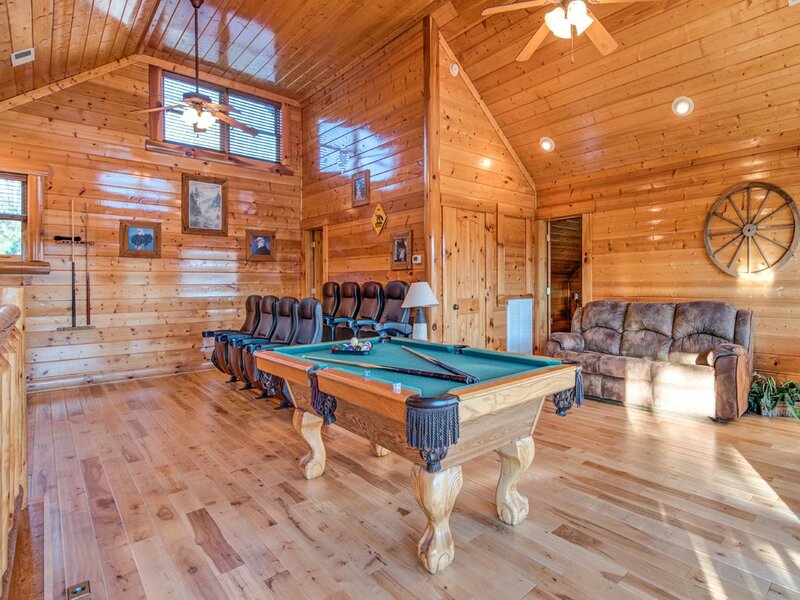 And sofas in the upstairs game room and the main floor’s great room open into queen-size beds. 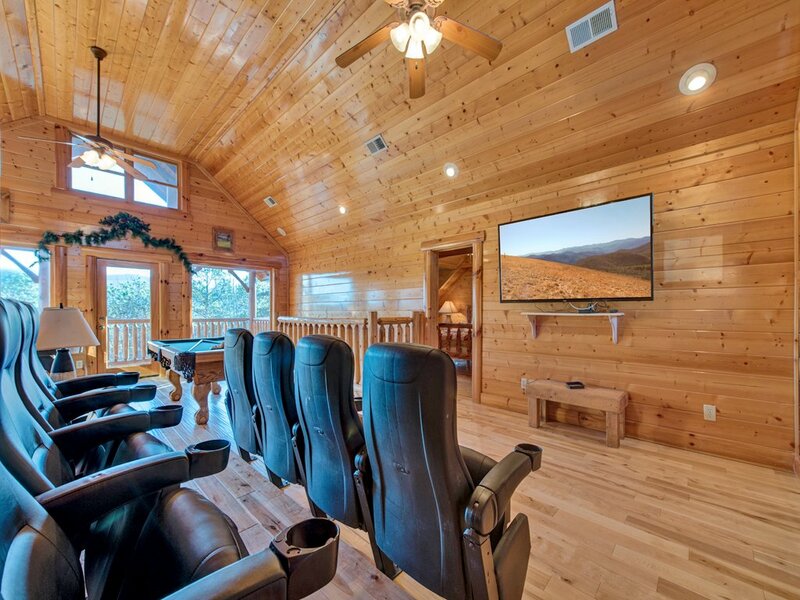 If you’re vacationing with kids, they might beg to be allowed to sleep in the game room. 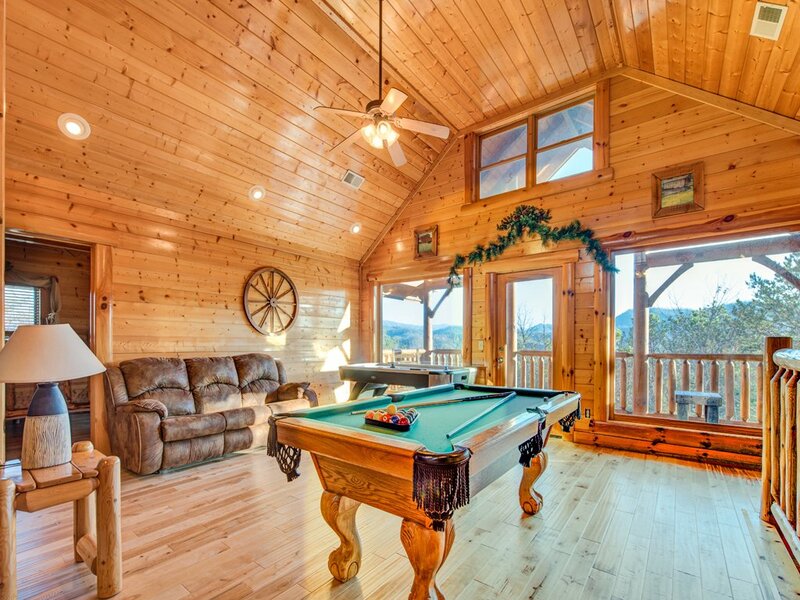 After all, what kids wouldn’t want to have air hockey and a full-size pool table in their sleeping quarters? 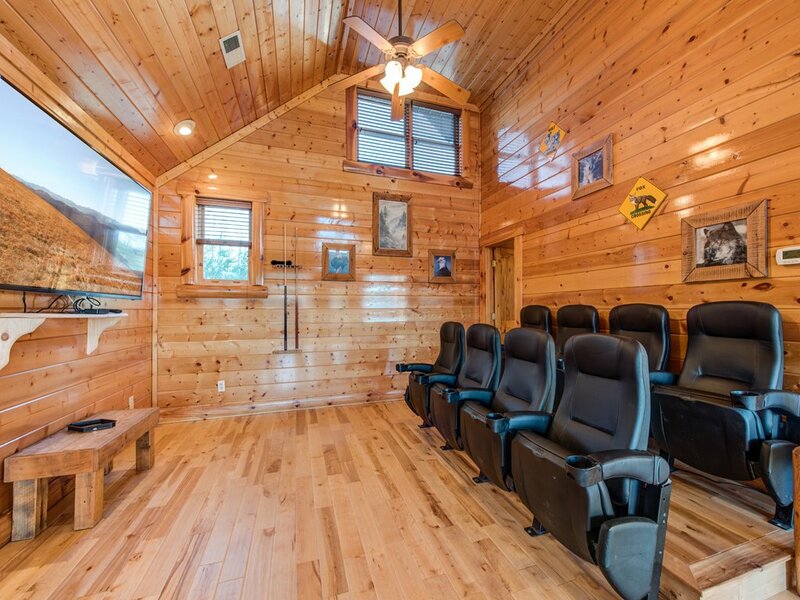 What’s more, the game room encompasses a home theater complete with a large screen and 8 cinema-style seats. 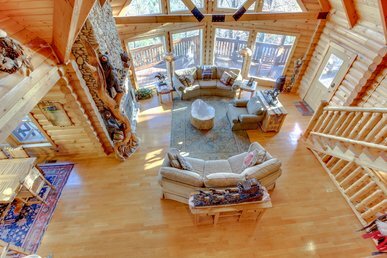 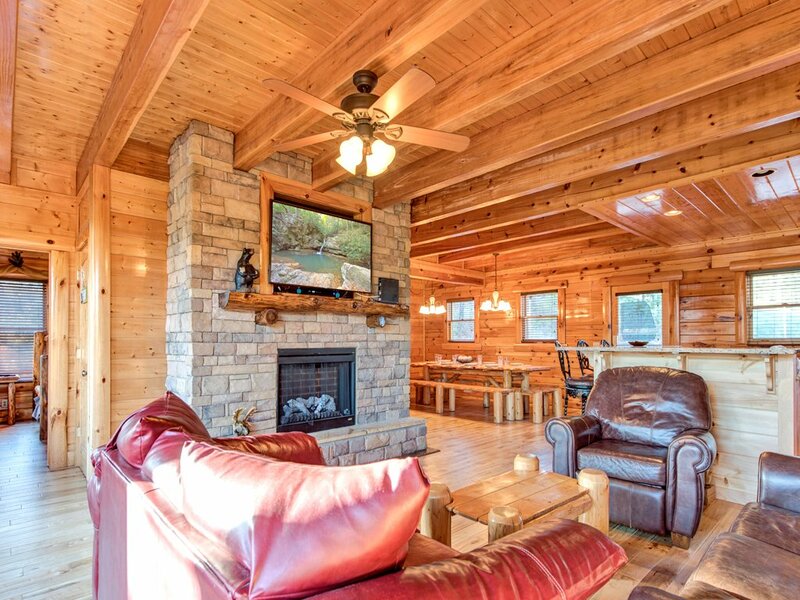 The main floor of Majestic Highbearnation is home to the great room, a sunny, wide-open space with wood-planked walls and floors, a beamed ceiling, and a decorative fireplace. 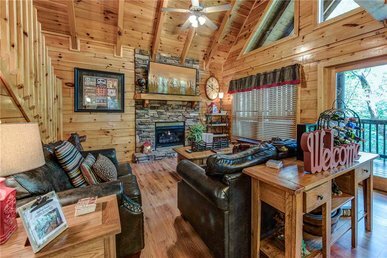 Stretch out on a sofa to watch TV, curl up in the armchair with a book, or perch at the breakfast bar with your laptop to surf the web via the free WiFi. 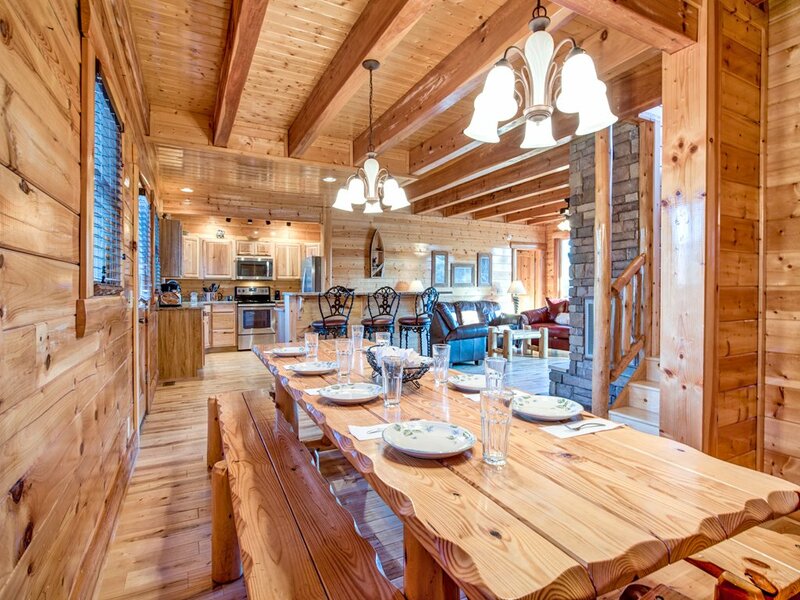 The log-style dining table seats 8 people with room to spare, and another 4 can sidle up to the adjacent breakfast bar. 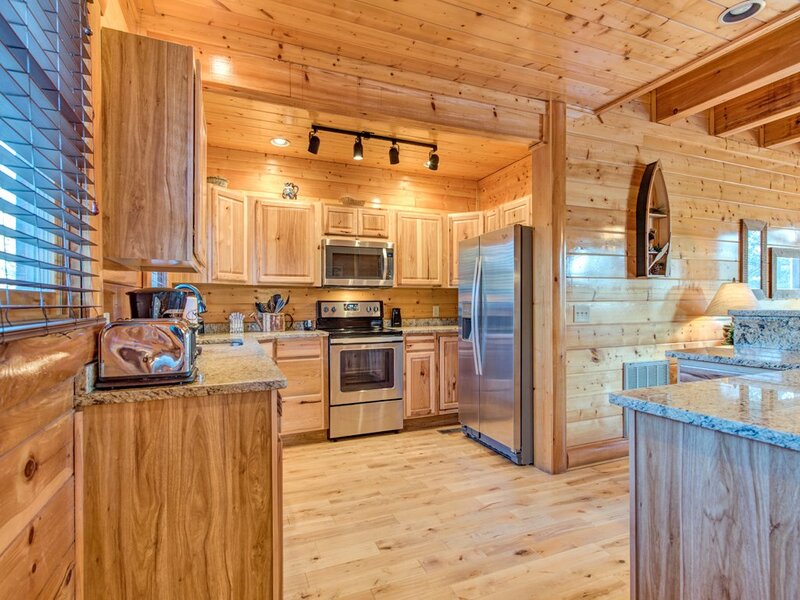 The kitchen is equipped to accommodate a small crowd, with gleaming stainless-steel appliances and plenty of cookware, tableware, storage, and counter space. 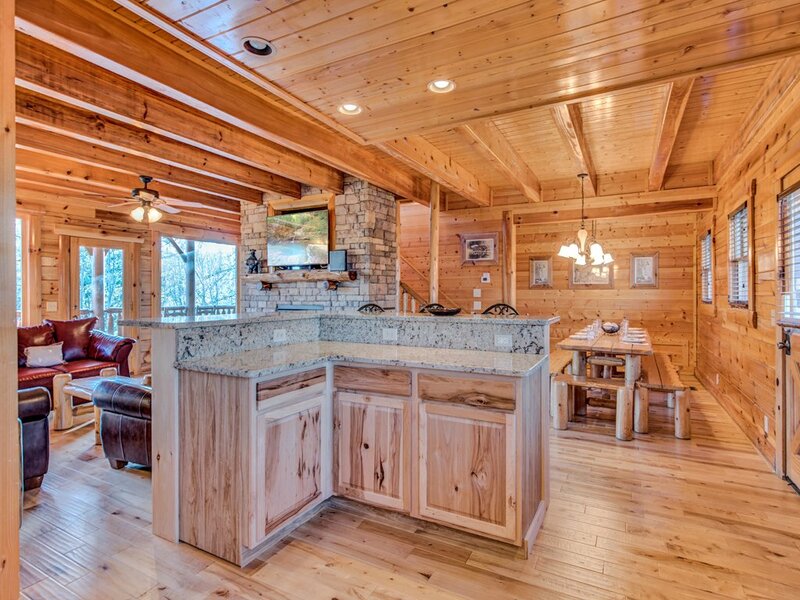 Cooking here definitely won’t feel like a chore. 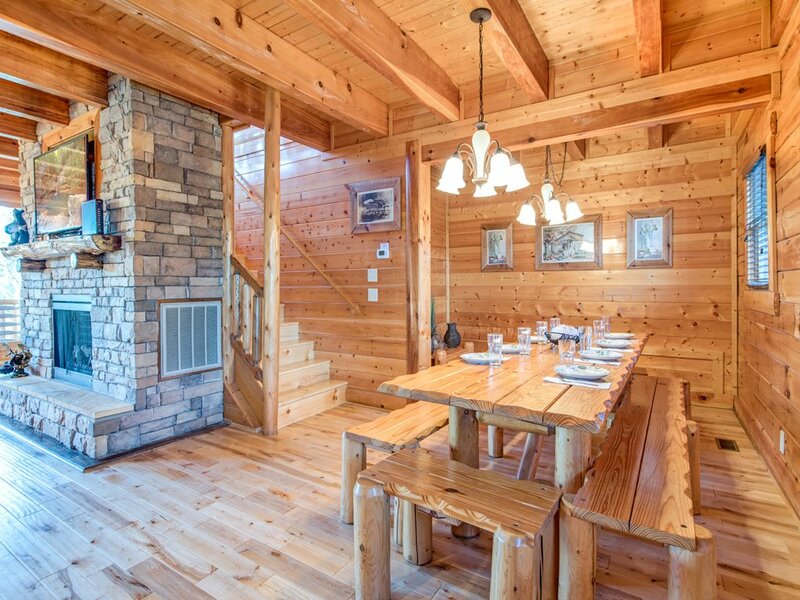 If you have a hankering for barbecue, you can take advantage of the outdoor park-style charcoal grill. 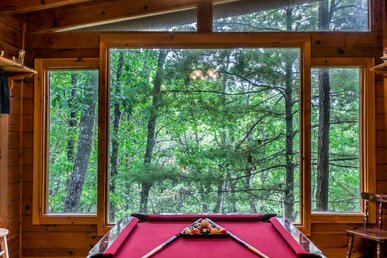 In fact, you’ll probably be spending much of your time outdoors. 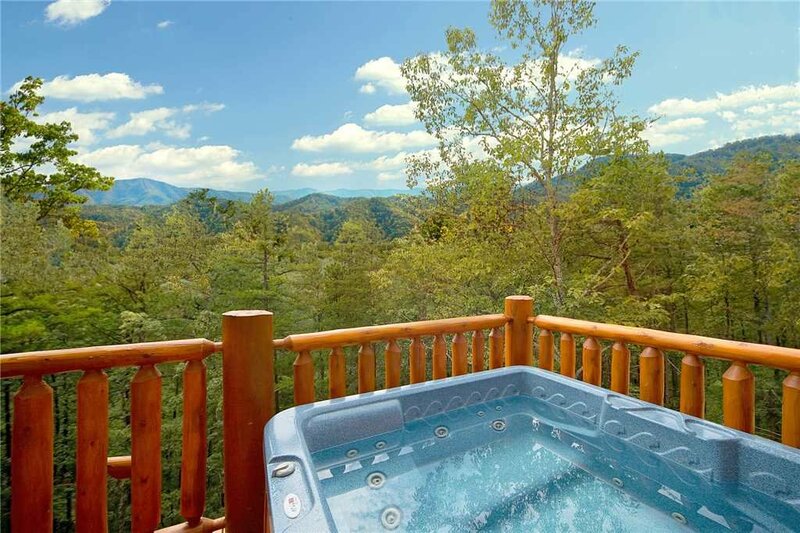 Majestic Highbearnation's 2 decks look out over lush woodlands toward the Great Smoky Mountains. 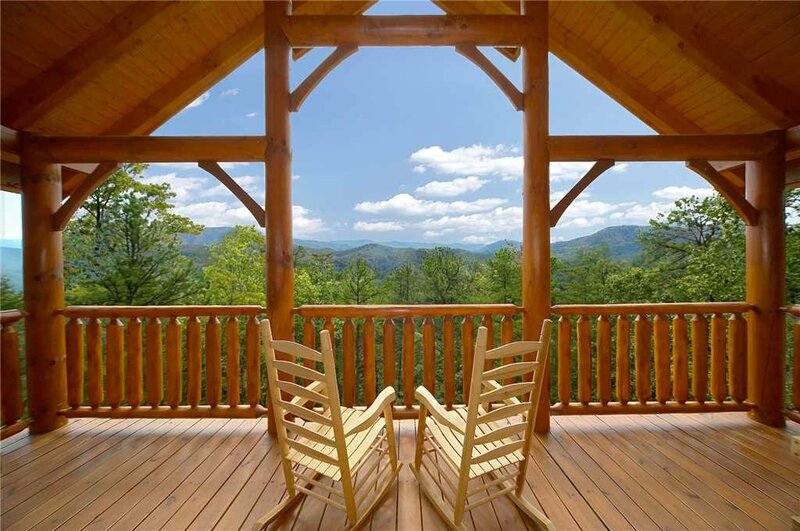 The combination of the crisp breezes, the birdsong, and the majestic mountains poised against the seemingly endless sky is magical—you simply have to experience it for yourself. 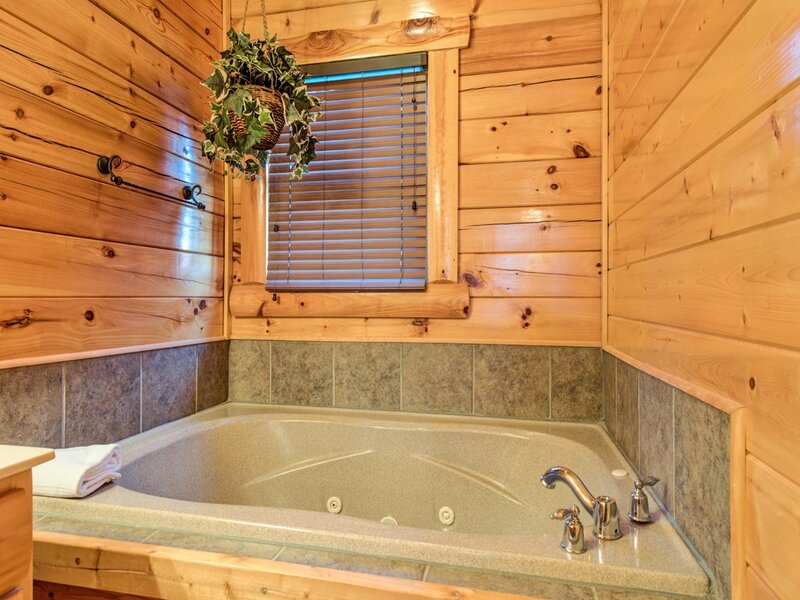 Kick back on one of the deck rocking chairs or, better yet, laze in the deck hot tub. 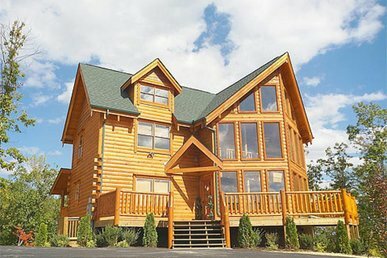 Now you’ll understand how Majestic Highbearnation got its name! 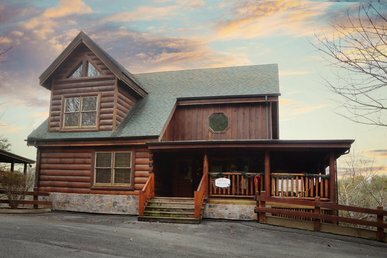 Should you want a change of pace from lolling on the deck and lazing in a jetted tub, you can get to the attractions of Pigeon Forge in well under a half-hour. 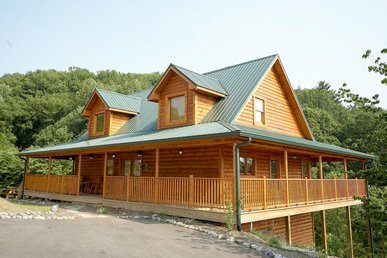 And you don’t have to bump along winding dirt roads; we’re talking well-paved, easy-to-drive roadways. 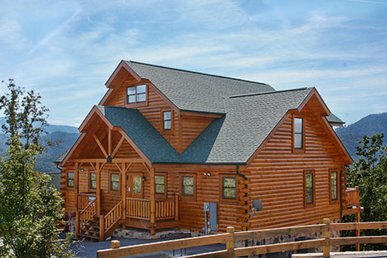 Pigeon Forge is home to Dollywood, of course, as well as the Titanic Museum, Parrot Mountain and Gardens, dinner theaters, outlet shops, mini golf, go-karts, restaurants, and more. 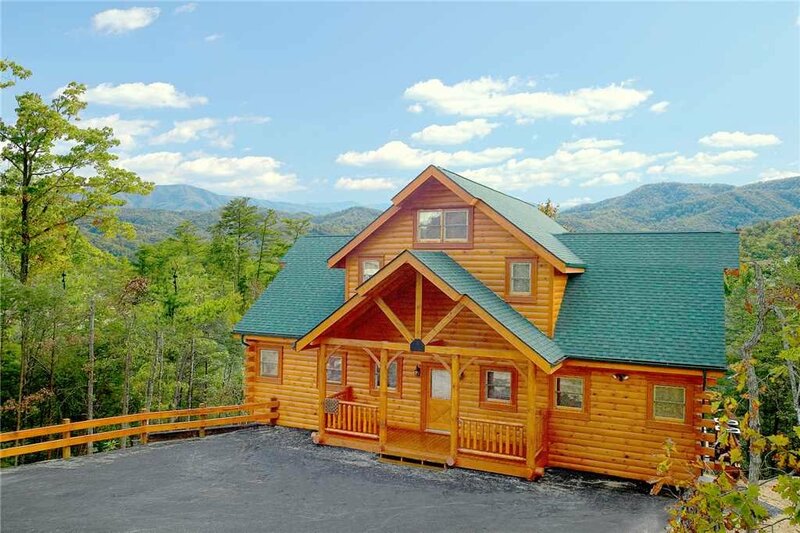 Also nearby is the Great Smoky Mountains National Park; no visit to the area is complete without exploring its flora and fauna on foot, by bike, on horseback, or by car. 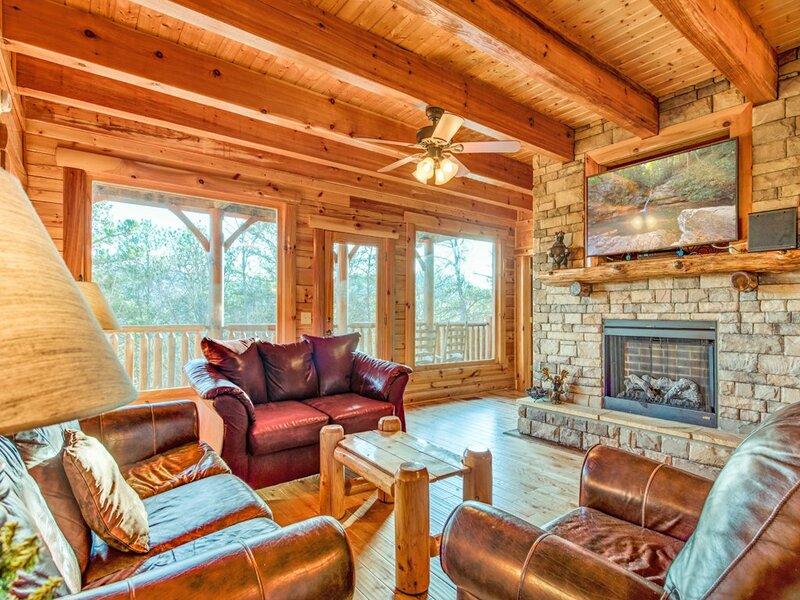 If relaxation, comfort, and the opportunity to relish nature’s beauty are priorities for your next vacation, Majestic Highbearnation is exactly what you’ve been looking for.